María de la Luz Vázquez proudly receiving her primary studies certificate. Meeting her daughters’ teachers used to be difficult for María de la Luz Vázquez. 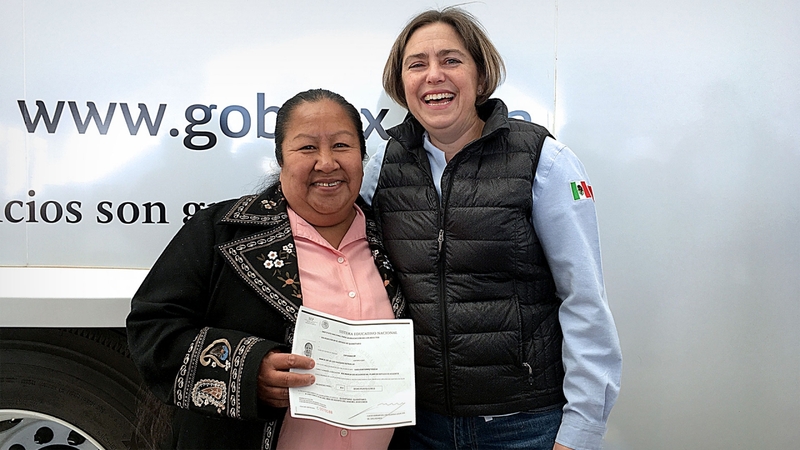 A single mother from the community of Calamanda, in Querétaro, Mexico, during parent-teacher conferences Vázquez felt ashamed of the fact that she herself did not know how to read or write. Today her daughters are 28 and 19, and it’s Vázquez’ great pleasure to do her own homework alongside her young granddaughter after successfully receiving her primary school certificate through the literacy program of the National Institute for Adult Education (INEA). 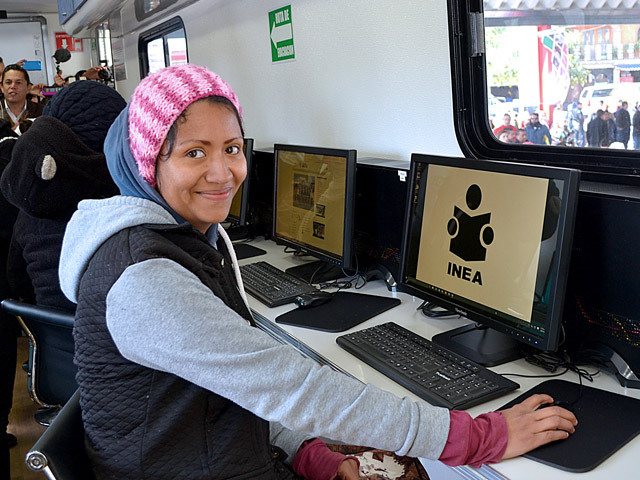 INEA’s mission is to give access to education to millions of Mexicans who never had the opportunity to study, and as adults do not know how to read or write. TransCanada contributed to this important cause by donating the equivalent of two million dollars (USD) in equipment to help INEA’s teachers reach distant communities. After 36 years of operation, this is the largest donation INEA has ever received. It will enhance the lives of thousands of people living in the areas surrounding TransCanada’s gas pipelines across six states: Guanajuato, Hidalgo, Puebla, Querétaro, San Luis Potosí and Veracruz. “Every day we work to be good neighbors and help the people in the communities where our pipelines cross,” said Chris Pelto, project manager for TransCanada’s Tula-Villa de Reyes pipeline, which once complete will transport high-efficiency natural gas to reduce emissions from power generation facilities in Central Mexico. “These mobile units and equipment will support education in remote places and open opportunities for people to learn to read and write. Once people complete their primary and secondary studies, they can aspire to better living conditions, better jobs, more education and higher salaries,” Pelto added. According to Luis Gerardo Helguera Ugalde, delegate of INEA in Querétaro, six municipalities and over 32,000 people in the state will benefit from this donation. “By providing education, we are providing the opportunity to discover a world of better opportunities; education is the heart of progress ,” he added. As part of TransCanada’s commitment to education, the company offers scholarships to students near our operations in Mexico, the U.S. and Canada. Learn more by visiting tcscholarships.com.